Facebook Gifts are popular with Facebook users. By going to the Facebook gift shop Facebook users can send each other virtual gifts which show up as an icon on the recipients Facebook profile. Gifts are either paid for directly to Facebook (previously $1 per gift but now done through a paid credits system) or are free gifts if they are advertiser funded. Lightspeed estimate that Facebook gain $35m of revenue this year through selling virtual gifts to users! 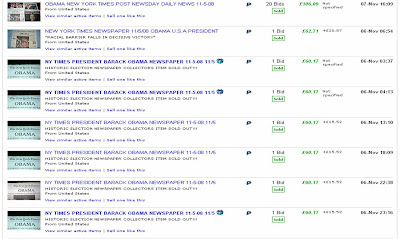 The New York Times have tapped into this and is currently offering a free Barack Obama virtual gift to Facebook users. There is clearly a demand to celebrate the Obama win by owning the New York Times 'Obama Wins' front page, so the New York Times have created a Facebook gift that allows Facebook users to send each other a virtual copy of the 'Obama Wins' front page and have it showing on their profile. The receipt of the gift is then publicised on the users feed and shows up on the recipients profile. The New York Times 'Obama Wins' virtual gift is a great example of how brands can engage with users using Facebook virtual gifting. The gift is limited to 2,000,000 and I assume it will be gone shortly (free gifts usually have a limited life span.) Get your virtual 'Obama Wins' front page while you can! 'There's No-One As Irish as Barack Obama' - new song celebrates Obama's Irish roots!